Don’t blame the Denair High School boys basketball team for feeling disrespected. 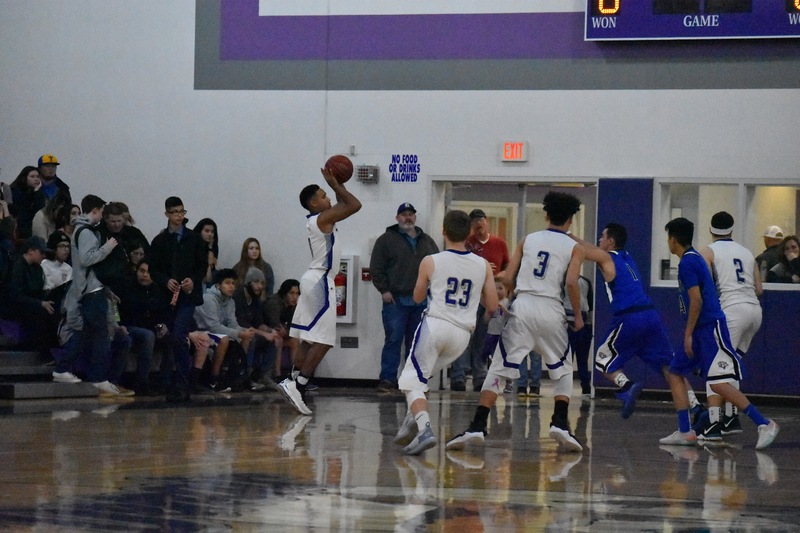 Despite finishing a strong second in the Southern League and winning 10 of their final 13 games, the Coyotes will open the Sac-Joaquin Section Division V playoffs on Wednesday night on the road as the 11th seed against a team with a losing record. No one ever said life, or playoff brackets, was fair. Ahead of last Friday’s home game against Waterford, the predicted playoff scenario showed Denair as the possible No. 8 seed, which would have meant a first-round home game. That was one of the points Denair Coach R.J. Henderson stressed to his players, who rose to the challenge behind 34 points from senior guard Drew Pritchard to beat Waterford 78-74. So, instead of a possible home game in front of a raucous crowd, the Coyotes (16-10 overall, 9-3 SL) must travel to Sacramento to take on Bradshaw Christian (10-18, 4-6 in Sierra Valley Conference). The Pride suffered a 10-game losing streak from mid-December to mid-January, but notable among its victories is a 72-66 win last Friday over Liberty Ranch (26-2), the top seed in the Division IV bracket. As it has much of the season, the Coyotes will rely on seniors Pritchard (14.5 points per game, 3.2 assists per game) and Steffin Winston (13.3 ppg, 8.9 rebounds per game) and junior Austin Uphold (11.1 ppg, 7.1 rpg) to provide most of the scoring punch. “Winston was probably the best player we had the back half of league,” Henderson. The senior forward has been hot lately. Winston had 23 points and 15 rebounds in 63-54 road win over Le Grand last Wednesday, and 21 points and seven rebounds in 73-35 road win over Delhi on Feb. 1. Tip-Ins: The game begins at 7 p.m. at Bradshaw Christian, 9555 Calvine Road in Sacramento. … Henderson said the gym is small, so he recommends getting there early. … There are plans to charter a rooters’ bus for Denair High students. Because of the long Presidents’ Day weekend holiday, there is no school Thursday and Friday. … The winner of Wednesday’s game plays Friday against the winner of No. 3 Sacramento Adventist and No. 14 Leroy Greene. … It is the second year in a row the Coyotes have qualified for the playoffs. Last season, they lost to Summerville 55-32 in the first round. … Southern League champion Mariposa (22-5) is seeded fifth in Division V. The Grizzlies open at home Wednesday against No. 12 Hughes (15-10) of Stockton. … Top-seeded Brookside Christian (23-3) of Stockton has a bye and won’t play until Friday at home against the winner of Woodland Christian and Rio Vista.